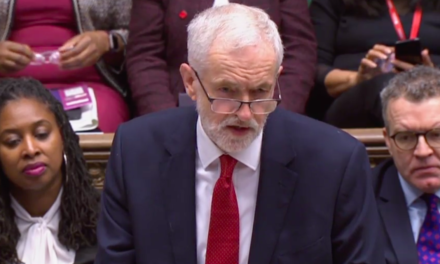 PMQs: Corbyn brands no-deal preparations a “costly charade”. Is he right? May argued in response that she has won clarifications on the backstop (not enough), published a package of commitments for Northern Ireland (already rejected by the DUP) and plans to give parliament a greater role in the process. MPs are to be offered a vote, in 2020, she revealed, on either extending the transition period or enacting the backstop. This would force parliamentarians to choose between the backstop – i.e. their main objection to the deal – and paying more to the EU without representation, which is bound to be offensive to their constituents. Not much of a choice there. Much of PMQs this afternoon saw the Labour leader setting out his complaint that no-deal preparations are a “costly charade”. This echoed his widely misinterpreted comment earlier this week, when accusing the Prime Minister of engaging in “Project Fear” – a reference to the futility and expense of no-deal prep, not the argument hard Brexiteers make that no-deal is nothing to be feared. “End this costly charade and rule out no deal,” Corbyn demanded. “The only way to avoid no deal is to vote for the deal,” came the inevitable reply from May. The difficulty of this exchange, and the reason it is repeated ad infinitum, is that both are right in different ways. It is true to say, as Corbyn presumably wagers, that Theresa May will not want her legacy to be the chaos of an unmanaged no-deal outcome (which has just become more unmanageable thanks to the government defeat yesterday). Her remarkable efforts to cling onto power despite losing further confidence and authority every day are explained by her determination to get and pass a Brexit deal. A bad deal if necessary, despite her patently false “no deal better than a bad deal” slogan. It is also correct, however, that MPs will be getting no deal unless they agree on something. And although MPs have repeatedly shown – with particular force last night – that a majority amongst them are opposed to no deal, there have not been any signs so far that a Brexit solution can win approval in the Commons. Not a ‘managed no deal’, nor ‘Norway Plus’, nor a ‘people’s vote’. It still looks as if the only way through is Labour’s proposal, which requires toppling the government and securing an election. Or does it? If May returns to the chamber with a Plan B, it should be amendable according to the pre-Christmas Grieve amendment. This would allow MPs to put forward their own alternatives, which might be the key to breaking the deadlock.